Yes, it is the 4th of July holiday, but it's also a recess week - AGAIN. And yes, it is super important that Senator Flake and our other elected officials hear from us while they are home in Arizona this week. The vote on the Senate’s ACA repeal was delayed last week, but that does not mean this fight is over. We know that Senator McConnell will be working as hard as he can to find the votes he needs to push this through the Senate. So we have to make our voices heard and make sure Senator Flake doesn’t forget about the harm that would be done to thousands of Arizonans if he votes in support of repealing the ACA. The Senate’s so-called “replacement” of the ACA makes coverage worse, increases premiums, and ends Medicaid as we know it. Thousands of our fellow Arizonans depend on AHCCCS coverage, and Arizona's budget cannot support this program without federal contributions. 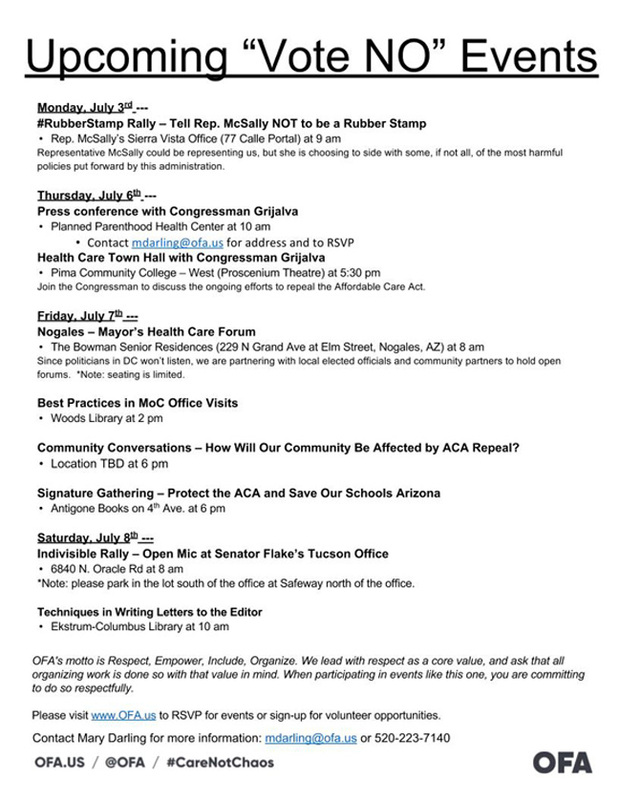 Join us at a Recess event listed below to urge Senator Flake to vote NO on the ACA repeal and make your voice heard. Ever wondered how to Start Effective Conversations with people who may have different political views than you? This Wednesday at 5 pm OFA and Swing Left will be hosting the third Turning Action into Organizing training - a framework on how to hold effective conversations to bring people together. Don’t forget to sign up for the training series if you haven’t yet! As always, thank you for the work that you do. Take some time to enjoy the holiday, but don't forget about the important work we have ahead of us and the crucial role that each and every one of us plays in this fight.